If you re ready to glow like whoa, then it s time to tell the competition to step aside! It s your turn to Glow All Out! This Double Dip approved formula creates envy worthy results with its BB cream airbrush finish, coupled with color correcting, contouring agents, cellulite fighters, and tan extending technologies. 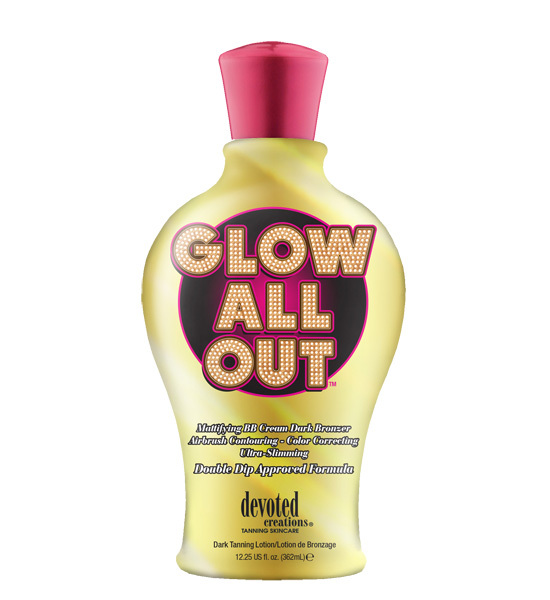 Formulated for those who don t want to turn heads, but for those who want to break necks Glow, baby glow! Japanese Rose Refines pore size while boosting collagen production and reducing excess oil. Blue Tansy Flower extract that contains calming and healing properties while using blue hues to counteract orange tones in the skin to provide the most natural color possible. C5 Technology Silicone feel, without the silicone. Lightweight, silky-smooth skin conditioner that helps lock in skin s moisture and tanning results. MelaTime Boosts Melanin production for faster, darker results. FreshTek Proprietary blend of deodorizing and skin freshening ingredients.